On this stage, the Camino runs along the river Arga, at the foot of a group of hills covered in beech, oak and Scots pine. As we approach Pamplona, the landscape shows the obvious influence of civilisation; with its conifers, reafforestation and farmlandsa. 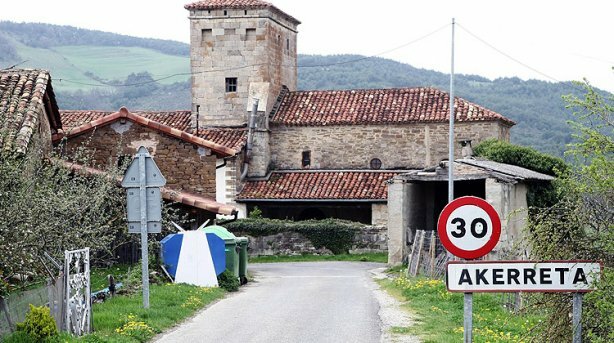 Half-way between Orreaga/Roncesvalles and Pamplona stands Zubiri, an essential stopover on the ‘French route’ of the Pilgrim’s Way to Santiago. Surrounded by beautiful scenery, Zubiri is the main town in the Esteribar valley and one of the biggest in the area. Although it has undergone a recent transformation it still conserves some features from the 18th century. 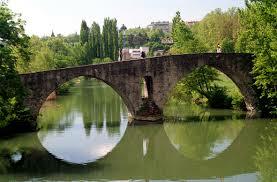 The mediaeval bridge that give the town its name crosses the river Arga. It is also known as ‘Rabies Bridge’ and witnessed a singular tradition in years gone by: animals were walked around its main pillar to stop them getting rabies because legend says that the pillar has the power to cure the disease. 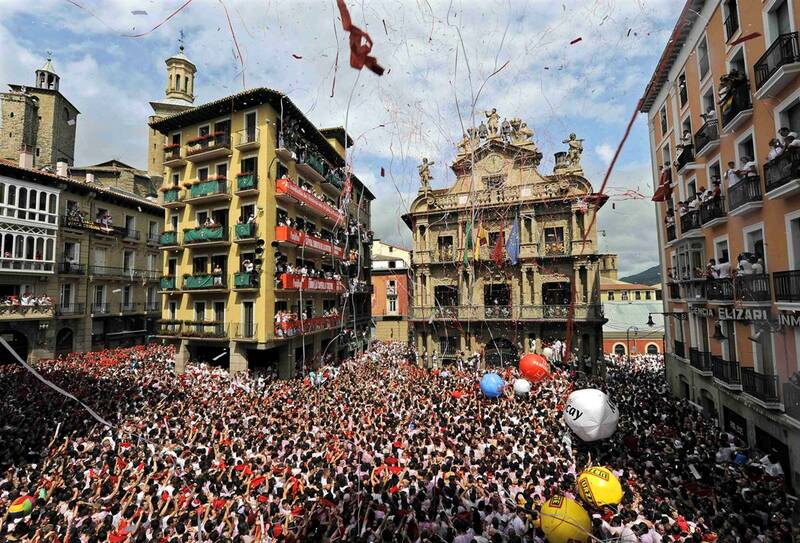 The festivities of Zubiri are held in the first week of August in honour of San Esteban. 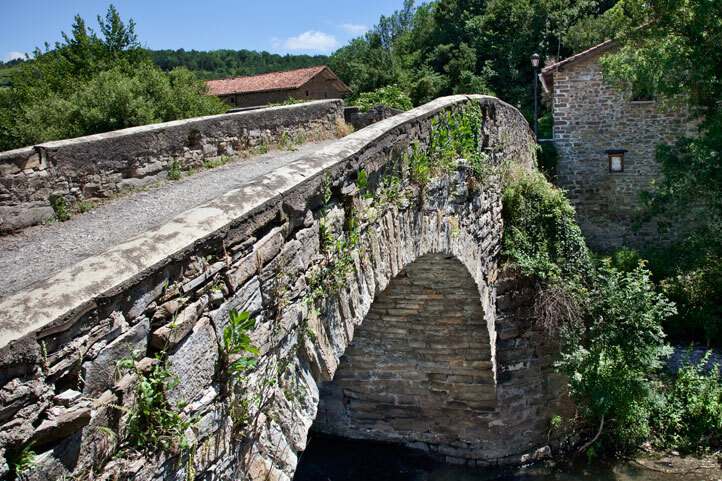 To start the way to Pamplona from Zubiri, instead begins at the medieval bridge of this village, take a path that goes down between hedges and crosses the Ibesiko Erreka stream and goes up a stony slope first and a clear path afterwards. When you reach the Idoietako Erreka stream you have to cross a humped Japanese-style footbridge with a handrail. 200 m later, join the road to Osteriz and follow it for 500 m. Then take a track that crosses the Magna industrial facility. Follow this path, which leads up to the hamlet of Ilarratz. Following the paved track of the river park, you reach Zabaldika. The itinerary leads through the lower part of Zabaldika and along a path that comes out onto the road. Another recreational area can be seen 200m ahead; you get there by crossing the road. A narrow marked-out pathway keeps to the vertical embankment with its protective fencing and you soon reach the Arleta farm. Along open land you reach a low ridge where ruins of the abandoned village of Santiagozar still remain. Cross the Ronda Este (the ring road around Pamplona) through an underground walkway and then, along on a track that runs parallel to this road, you skirt mount Miravalles. From the highest point, a small road heads downwards towards the chapel of Trinidad de Arre, where you arrive after crossing the Ultzama River. The route continues along the main street of Villava, carries on via Burlada until it crosses the N-121 and continues along a tree-lined pathway (initially) and then along the edge of a narrow road until it reaches the Magdalena Bridge – the gateway to Pamplona.